Description of "A Job To Rule The World"
I was somewhere at the top of the mountain, standing on the rough surface in the midnight. The breeze stream was high, even In the hush I can hear the breeze clearing around. I never observed those wonderful flickering pixie lights in the night sky. “What happened to me?” I verbally expressed. I was probing for somebody who can answer my question. But I was in solitude there also I was too far from the city. Indeed, even I don't know which place it was. I was just feeling to stay there forever in the moonlight, that was the main source to glance around. I was feared as I just heard a voice and didn’t see anybody and I was all alone in there. In 2012, Akhil started his career as a Software Engineer. Currently he is working with a leading MNC in India. "A Job To Rule The World" is his first book and published in, Sep 2017. Akhil holds a bachelor's degree in computer science & engineering from GBTU, India. 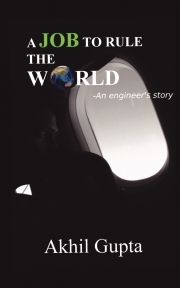 Reviews of "A Job To Rule The World"
The book first half was a common engineer's story, conversation between God and human was nice. The airplane scene was good. Probably ending is not satisfactory.